The Minnesota winter is unprecedented in the challenges it is bringing to even the sturdiest of landscaping. With the heavy snows and arctic-like temps we’ve had this year, if your landscape has suffered, you’re not alone. Homeowners all over the Minneapolis and St. Paul metro area may find that their yards are stressed by the season. Artificial insulation can supplant natural sources. Snow is the best way to insulate roots and other surfaces vulnerable to rapid changes in temperature, but isn’t always present in sufficient quantities. Whether plastic wrap, mulch, wood chips, or even burlap, materials are widely available to provide additional insulation where necessary. Barriers can deter animals from feeding. Rodents, rabbits, deer, and other animals can eat nearly anything, and are fond of plant life when other food isn’t available. Mesh wrappings are a good way of keeping them out. As cold as it has been, you may have wildlife trying to survive by nibbling on your trees and shrubs. To protect them from further damage, put barriers up now. Removing dead parts of trees will help the living parts thrive. 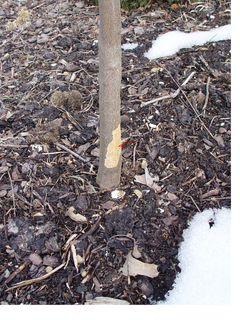 When the outside layers of barks, trunks, and larger branches have become diseased or have died, they can be more of a threat as a conductor of dangerous changes in temperature. Pruning, scraping, abrasion, and other techniques require care when performed on vulnerable anatomical areas, but offer significant relief when done properly. Chemical treatments must be used sparingly. Although many DIY products are available that supposedly “work magic” by creating layers of protection over specific types of plant cells, the effect is usually mild, and the risk of contamination is high. In the small number of cases when aggressive chemical treatment can be helpful, experience is necessary to avoid further damage. Relocation can redistribute risk of weather damage for some trees, shrubs, and perennials. Some types of injury are especially sensitive to the location in a garden and the direction the plant points at the most extreme times of the day. Evergreens should not be planted on the south sides of rigid structures, for example. Relocating plantings can be risky, but in extreme circumstances could be the lesser of evils. (Note: This is one that definitely will have to wait for spring.) It’s a good idea to have your yard evaluated by a professional Minneapolis landscape company this spring to assess winter damage, and whether some things should be relocated elsewhere in your yard. Our MN landscape care specialists at Achitectural Landscape Design know what to do in tough situations. Assessing the condition of your landscaping quickly—now and after the winter passes—will be important to take remedial actions in time to undo any damage as much as possible. If you have questions about how to ensure your yards and gardens will survive the winter, give us a call at (952) 292-7717 and we’ll be happy to talk you through your issues and options.